The statement Integer ino = (Integer)obj now converts, or casts to type Integer before storing it in ino. This is called an explicit cast, and the conversion process is referred to as casting. This is necessary to explicitly employ casts to translate between Object and the type of data that is actually being operated upon. 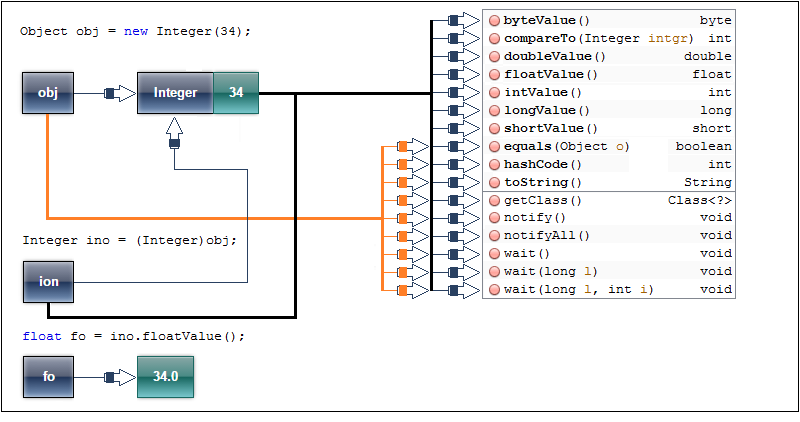 Class class encapsulates the run-time state of a class or interface. 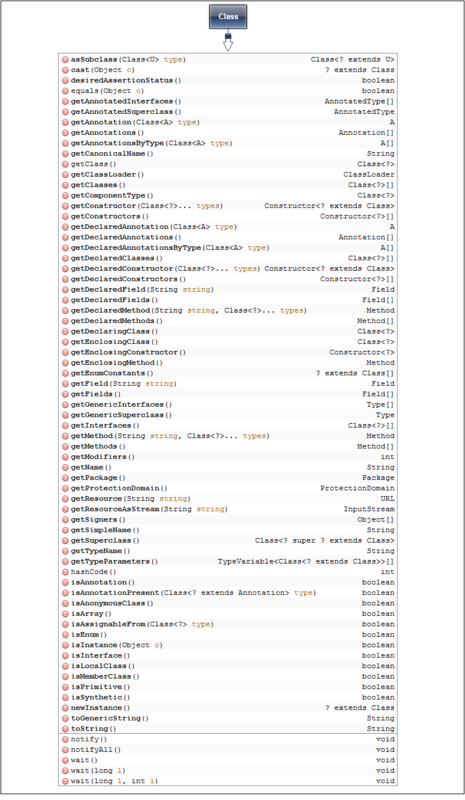 Objects of type Class are created automatically, when classes are loaded. You cannot explicitly declare a Class object. Class is a generic type(Class<T>). Generally, you obtain a Class object by calling the getClass( ) method defined by Object. Suppose you have a variable daob of type Data1 that might contain a reference to an object of type Data1, Data2, Data3, or even Data4. The third statement displays the type of obj. This statement outputs the type name as String. The fact that the reference is stored in a variable of type Object does not affect the underlying type of the object itself. 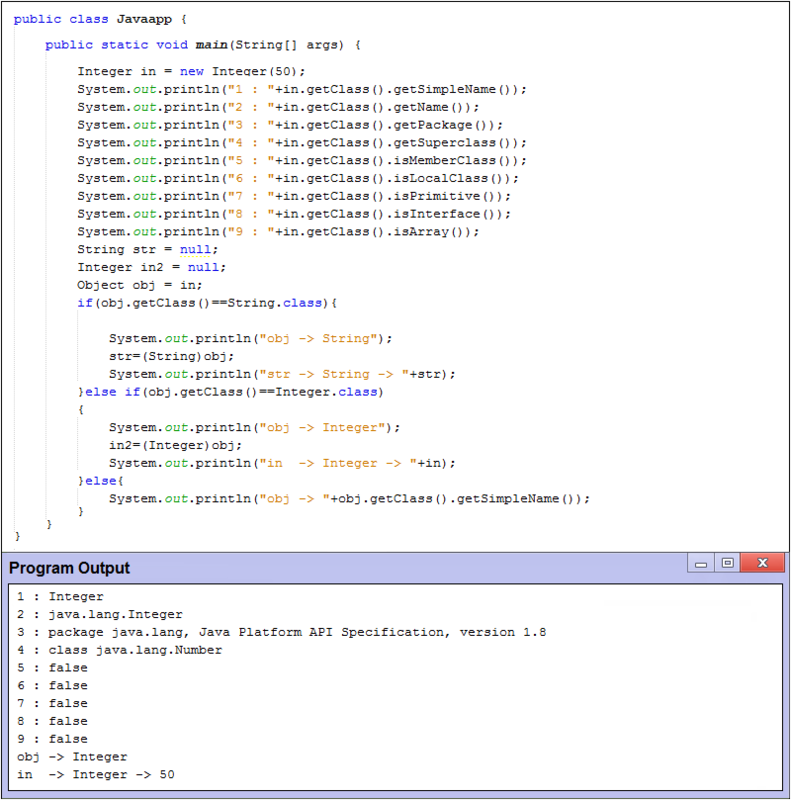 When your program is executing, there are instances of the Class class in existence that represent each of the classes and interfaces in your program. There is also a Class object for each array type in your program as well as every primitive type. The Java Virtual Machine (JVM) generates these when your program is loaded. Because Class is primarily intended for use by the JVM, it has no public constructors, so you can’t create objects of type Class yourself. Although you can use the getClass() method to get the Class object corresponding to a particular class or interface type, there is a more direct way. If you append .class to the name of any class, interface, or primitive type, you have a reference to the Class object for that class. For example, String.class references the Class object for the String class and Data1.class references the Class object for the Data1 class. This tests whether the object referenced by daob is of type Data1. Because each Class object is unique, this is a precise test. If daob contained a reference to an object that was a subclass of Data1, the result of the comparison in the if would be false.